While some people love ready-to-eat chicken served at fast food chains, many Vietnamese people still prepare chicken dishes by themselves because they love cooking at home for nutritional and safe meals for daily life. Yum: Chicken shanks in sauce are nutritious and eye-catching. 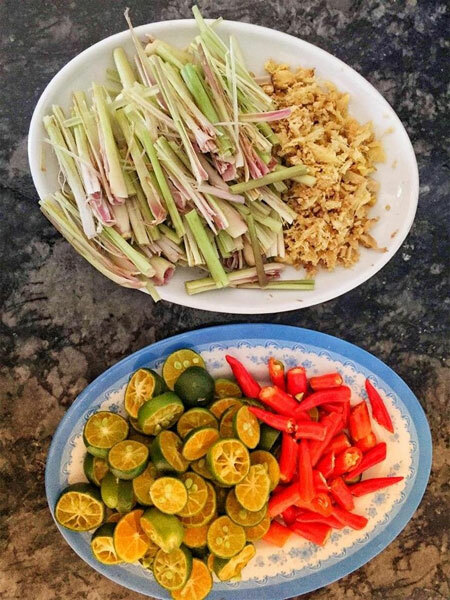 When a wife wants to give her husband a dish to take along to a football match, the top favourite is chicken feet with lemongrass, kumquat and chili. The dish has become popular among Vietnamese, especially teenagers who are avid snackers and men who want to take something with beer. My neighbour Pham Thanh Hai said it is a good choice for small parties as well. When you have many nutritious dishes which are braised, fried or grilled, you need to keep the meal balanced with something cool, sour, spicy and tasty. 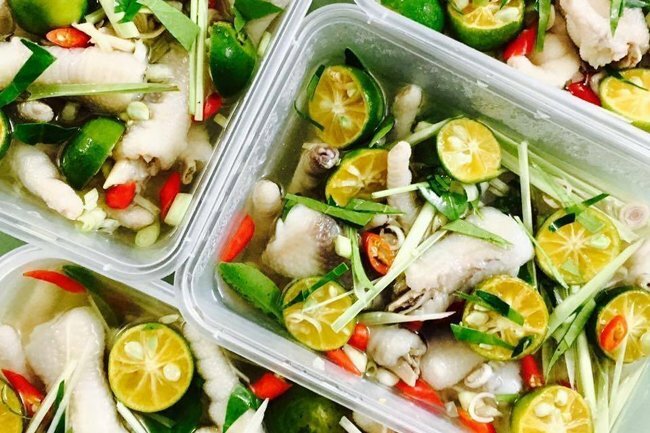 The dish is so popular that people can buy ready-to-eat chicken feet soaked in glass bottles. Hai worries about food hygiene so she often buys fresh chicken shanks at the market and makes the dish by herself. There are two main parts in making the dish, she said. “Firstly, you need to remove the chicken toe nails, wash and rewash all in salt water to make sure everything is clean,” she said. 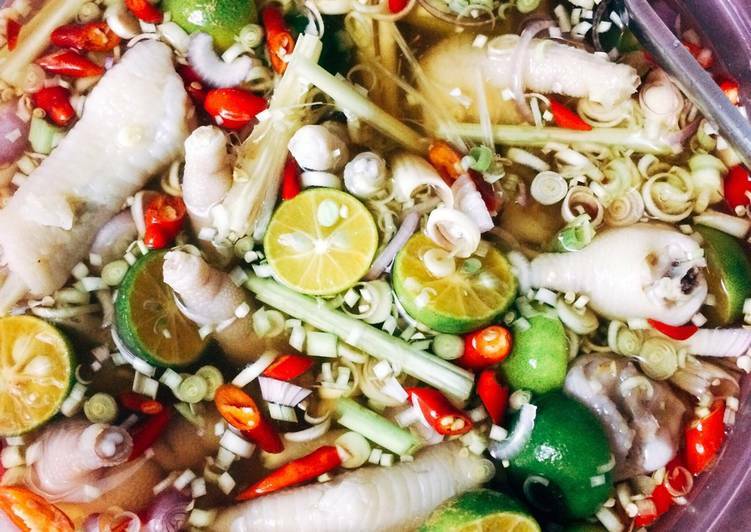 Step 2: Boil chicken feet with lemongrass and ginger, then put into a big bowl with salt and ice. To make sauce, she slices lemongrass, ginger, garlic, chili and kumquat into small pieces. Then she prepares a mixture of sauce with water, sugar, vinegar, fish sauce and salt. All the ingredients are dipped in that sauce. Hai recommended adding lemon leaves at the end to bring a good scent and avoid making it bitter. The dish is lovely at first sight. The colourful ingredients create an incredible harmony and charming fragrance. Hai also added that the dish should be stored in the fridge for one day in a glass bottle rather than a plastic one to avoid toxicity. 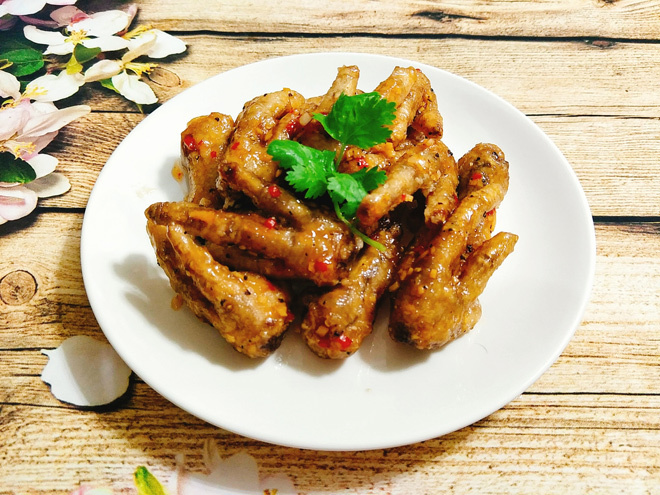 “Chicken feet marinated in this sauce are not only great munchies, they are also good for health with collagen that promotes better skin,” she said. With spicy, sweet and sour sauce, chicken feet and their chewy gelatinous tendons encourage us to eat without worrying about being too full. Chicken feet bring the endless joy of gnawing. Chân gà chiên mắm (chicken feet fried with fish sauce), a dish popular in the central region, now dominates food stalls in Hanoi. Instead of soaking in “rainbow” sauce, as is done with chicken feet with lemongrass, kumquat and chili, boiled chicken feet are fried on a pan coated in fish sauce and cooked until the sauce becomes condensed. Grilled chicken feet can come on a stick. Ly Van Phuc Street is known as BBQ chicken street. It’s easy to find your way to the street thanks to the scent pervading from the charcoal burners.